Today we share with you a proprietary framework we have developed for ensuring you deliver a high ROI on your market research investment. We call our framework MOSAIC™. It is an acronym for six steps. M is for map. Market researchers are the cartographers of the business world. We collect intelligence on the size of markets, the nature of the competition, the behaviour of customers, their needs, the effect of the brand, the importance of segmentation etc. Mapping is the starting point of all actions. O is for objectives. Armed with a market map and a full understanding of the subject, we must now set objectives. The objectives could be to launch a new product, develop a better customer value proposition, capture more value, enter a new market and so on. The objectives should be tightly scoped. They should be specific to a particular segment, measurable, realistic and timely. Everyone involved must be clear as to the objectives and know their role in achieving them. S is for strategy. The strategy is the plan by which the objectives will be achieved. 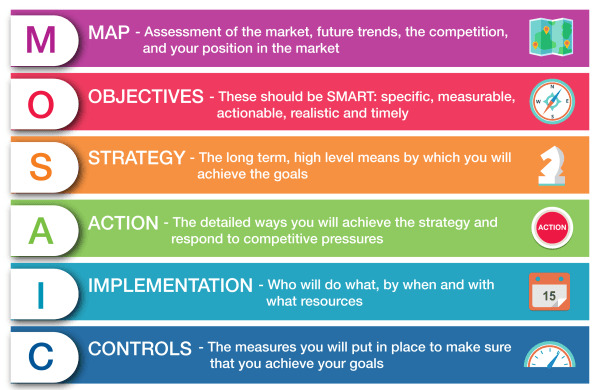 It is likely to cover product, price, channel and communications – effectively the 4Ps. A strategy is not for changing every week. Discipline will be important here for otherwise there is a temptation to ignore the strategy when things get difficult. The strategy should be followed closely though we may need to be flexible with the tactics. A is for action. We have now arrived at the point where action takes place. Here we need a detailed plan as to who will do what, by when and the resources needed. Of course, everyone must be fully apprised of their roles and responsibilities. I is for implementation. This is arguably where plans are most likely to fail. As we begin to implement the plan we stop talking and start doing. It can be the occasion when people find that the bold promises mean hard work or uncomfortable changes. Successful implementation requires support at all levels and especially from the top of the organisation. C is for controls. Controls must be in place to make sure that the actions are implemented. They also check that everything is going to plan. The controls will point to a need for a change in direction, should this be required. Use the MOSAIC framework to be sure that the excellent market research that you have commissioned has a high and rapid payback.